To make managing your AWS account easier, some AWS services perform actions on your behalf, including the creation and management of AWS resources. For example, AWS Elastic Beanstalk automatically handles the deployment details of capacity provisioning, load balancing, auto-scaling, and application health monitoring. To make these AWS actions more transparent, AWS adds an AWS Identity and Access Management (IAM) service-linked role to your account for each linked service you use. Service-linked roles let you view all actions an AWS service performs on your behalf by using AWS CloudTrail logs. This helps you monitor and audit the actions AWS services perform on your behalf. No additional actions are required from you and you can continue using AWS services the way you do today. To learn more about which AWS services use service-linked roles and log actions on your behalf to CloudTrail, see AWS Services That Work with IAM. Over time, more AWS services will support service-linked roles. For more information about service-linked roles, see Role Terms and Concepts. In this blog post, I demonstrate how to view CloudTrail logs so that you can more easily monitor and audit AWS services performing actions on your behalf. First, I show how AWS creates a service-linked role in your account automatically when you configure an AWS service that supports service-linked roles. 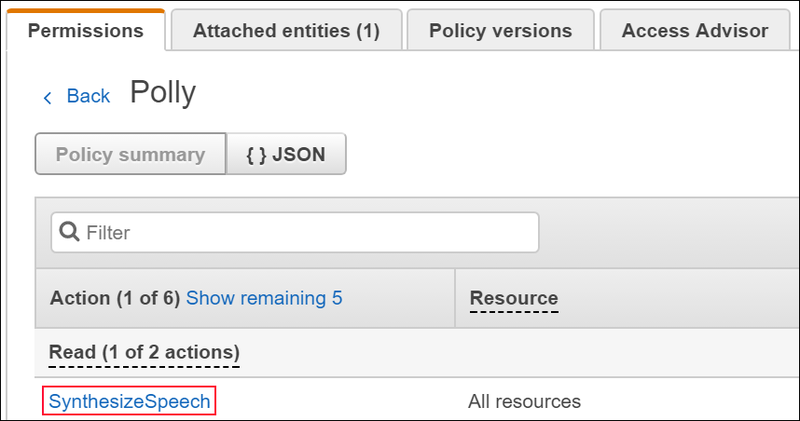 Next, I show how you can view the policies of a service-linked role that grants an AWS service permission to perform actions on your behalf. Finally, I use the configured AWS service to perform an action and show you how the action appears in your CloudTrail logs. I will use Amazon Lex as the AWS service that performs actions on your behalf for this post. You can use Amazon Lex to create chatbots that allow for highly engaging conversational experiences through voice and text. You also can use chatbots on mobile devices, web browsers, and popular chat platform channels such as Slack. Amazon Lex uses Amazon Polly on your behalf to synthesize speech that sounds like a human voice. AWSServiceRoleForLexBots — Amazon Lex uses this service-linked role to invoke Amazon Polly to synthesize speech responses for your chatbot. AWSServiceRoleForLexChannels — Amazon Lex uses this service-linked role to post text to your chatbot when managing channels such as Slack. You don’t need to create either of these roles manually. When you create your first chatbot using the Amazon Lex console, Amazon Lex creates the AWSServiceRoleForLexBots role for you. When you first associate a chatbot with a messaging channel, Amazon Lex creates the AWSServiceRoleForLexChannels role in your account. Navigate to the Amazon Lex console, and choose Get Started to navigate to the Create your Lex bot page. 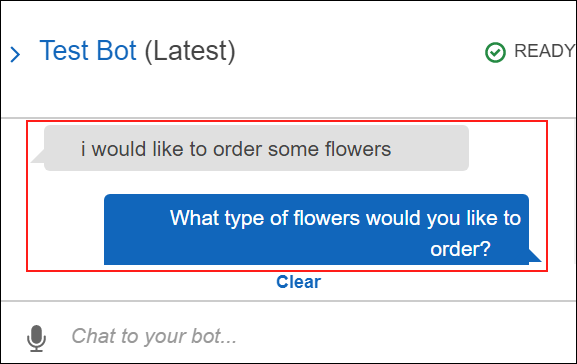 For this example, I choose a sample chatbot called OrderFlowers. To learn how to create a custom chatbot, see Create a Custom Amazon Lex Bot. When you scroll down, you will see the settings for the OrderFlowers chatbot. Notice the field for the IAM role with the value, AWSServiceRoleForLexBots. This service-linked role is “Automatically created on your behalf.” After you have entered all details, choose Create to build your sample chatbot. AWS has created the AWSServiceRoleForLexBots service-linked role in your account. I will return to using the chatbot later in this post when I discuss how Amazon Lex performs actions on your behalf and how CloudTrail logs these actions. First, I will show how you can view the permissions for the AWSServiceRoleForLexBots service-linked role by using the IAM console. When you configure an AWS service that supports service-linked roles, AWS creates a service-linked role in your account automatically. You can view the service-linked role by using the IAM console. Go to the IAM console, and choose AWSServiceRoleForLexBots on the Roles page. You can confirm that this role is a service-linked role by viewing the Trusted entities column. Choose the Trust relationships tab on the AWSServiceRoleForLexBots role page. You can view the trusted entities that can assume the AWSServiceRoleForLexBots service-linked role to perform actions on your behalf. 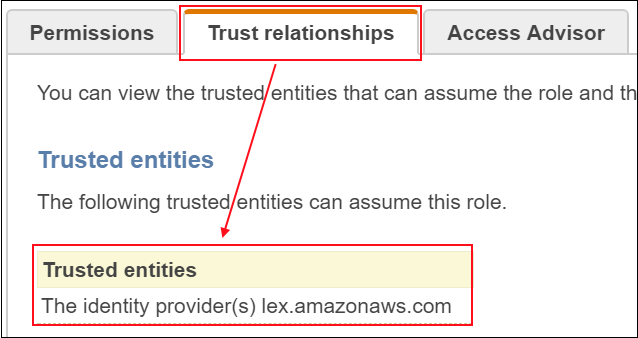 In this example, the trusted entity is lex.amazonaws.com. Choose AmazonLexBotPolicy on the Permissions tab to view the policy attached to the AWSServiceRoleForLexBots service-linked role. You can view the policy summary to see that AmazonLexBotPolicy grants permission to Amazon Lex to use Amazon Polly. Choose Polly to view the action, SynthesizeSpeech, that the AmazonLexBotPolicy grants permission to Amazon Lex to perform on your behalf. Amazon Lex uses this permission to synthesize speech responses for your chatbot. I show later in this post how you can monitor this SynthesizeSpeech action in your CloudTrail logs. Now that I know the trusted entity and the policy attached to the service-linked role, let’s go back to the chatbot I created earlier and see how CloudTrail logs the actions that Amazon Lex performs on my behalf. As discussed already, I created an OrderFlowers chatbot on the Amazon Lex console. I will use the chatbot and display how the AWSServiceRoleForLexBots service-linked role helps me track actions in CloudTrail. First, though, I must have an active CloudTrail trail created that stores the logs in an Amazon S3 bucket. I will use a trail called TestTrail and an S3 bucket called account-ids-slr. When the chatbot replies using voice, Amazon Lex uses Amazon Polly to synthesize speech from text to voice. Amazon Lex assumes the AWSServiceRoleForLexBots service-linked role to perform the SynthesizeSpeech action. Now that I have created the chatbot, let’s see which actions were logged in CloudTrail. Choose CloudTrail from the Services drop-down menu to reach the CloudTrail console. Choose Trails and choose the S3 bucket in which you are storing your CloudTrail logs. In the S3 bucket, you will find log entries for the SynthesizeSpeech event. This means that CloudTrail logged the action when Amazon Lex assumed the AWSServiceRoleForLexBots service-linked role to invoke Amazon Polly to synthesize speech responses for your chatbot. You can monitor and audit this invocation, and it provides you with transparency into Amazon Polly’s SynthesizeSpeech action that Amazon Lex invoked on your behalf. The applicable CloudTrail log section follows and I have emphasized the key lines. Service-linked roles make it easier for you to track and view actions that linked AWS services perform on your behalf by using CloudTrail. When an AWS service supports service-linked roles to enable this additional logging, you will see a service-linked role added to your account. If you have comments about this post, submit a comment in the “Comments” section below. If you have questions about working with service-linked roles, start a new thread on the IAM forum or contact AWS Support.